I remember the first time I saw a Coach handbag. It was about 1990 or so, and I was a preteen learning as quickly as I could about the latest fashions so that I could keep up with the Junior Joneses. And upon looking back I have to grin. Like so many of us have experienced as bonafide grown-ups, what was new then is vintage clothing now. 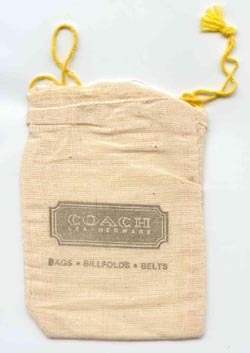 1982 vintage Coach handbags and shoulder bags. The Coach bag was at a neighbor's house. The mom had bought it for the daughter. Both were a bit spoiled but lovely people, and had a taste for nice things. The daughter presented the handbag to me with a luxurious air. It shows my immaturity to acknowledge that my reaction to this designer bag was disappointment. "What's the thrill here?" I thought upon seeing the plain brown flap and super simplistic lines. There was no fluorescence to it, nor any glossy patent leather with (now-vintage) squiggles or splatter paint. I was naive and Coach was at its best. Since then, the Coach brand has grown tremendously. What's more, its offerings have managed to bridge that difficult gap between high quality and affordable price, so as to furnish the masses with a name still well-liked among handbag lovers. And as the history of Coach handbags shows, it began with six craftspeople in a New York loft seventy years ago. At that time, and even by the 1980s, Coach was just good leather. No fancy brocaded canvas, no peacock colors commemorating handbag anniversaries, no oversized chains and grommets. Just good, smooth, time-testable leather. And when we came across this vintage Coach purse, I got a bit of nostalgia for those days. Then I saw the pamphlets inside, still held in a diminutive muslin bag, and the vintage clothing collector in me just beamed. I love stuff like this. One piece of ephemera is dated 1982 which is always nice to get a pinpoint of a date. 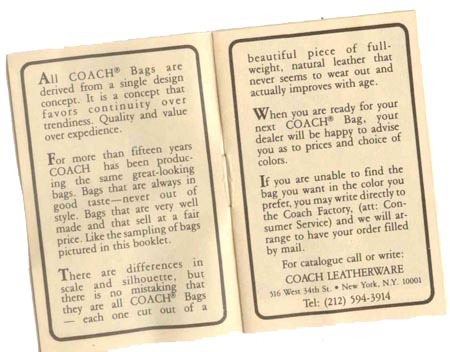 Besides the vanity-printed bag, there's a wonderful fold-out that shows other vintage Coach handbags in the same collection, care instructions, a description of Coach's approach to leather, and a little pamphlet that describes The Factory based in New York City creating artisan quality leather goods since 1941. A terrific glimpse at an American label still in business after decades of beautiful handbags. I just bought a Coach handbag at a yardsale for $20. In the pocket inside it contained all the little booklets and baggie along with the original receipt and the registration card filled in with the serial number but the owner never sent it in.